Madagascar is full of strange plants. 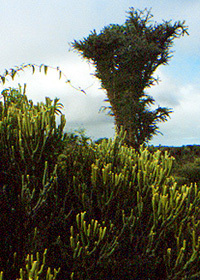 The plant in the foreground is one of the coralliform Euphorbias that are so diverse on the island, so named because the odd branching of the stems reminded early botanists of corals.The tree in the background is Alluaudia comosa (Didieriaceae). Photographed near Tulear in the southwest.